In the 1830s and 1840s California was sparsely populated. People living there communicated with those in the east by sending mail aboard sailing vessels that traveled down the west coast of California, the west coast of Mexico, the west coast of South America, around the treacherous tip of Cape Horn and up the Atlantic side of those countries to New York or Boston where their letters would travel inland via a well organized postal system. The trip took several months. Official mail service within the interior of California was nonexistent. Persons or their representatives traveled to “post offices” (often taverns & general stores) in towns like San Francisco to receive their mail. As slow and awkward as this system was, the population accepted it. Then, two events occurred which heightened the demand and expectation for better postal service. First, the discovery of gold in 1849 at Sutter’s Mill in the western foothills of the Sierra Nevada Mountain range turned the trickle of migration coming from eastern states into a torrent. In the ten years following the discovery of gold the population of California grew by over 300,000 souls. Once they arrived, miners who had made the trip without their families and families who had left relatives behind were anxious to hear from loved ones back east. Second, the end of war with Mexico saw California become a state in 1850. With statehood, many towns established official post offices. However postal authorities in both the west and east were slow to respond to the demand for better mail service. Enterprising merchant vessel companies created a shortcut for eastern-bound mail. South-bound vessels landed on Panama’s western shore. Mule trains carried the mail overland to Panama’s eastern coast where it was loaded aboard sailing ships bound for ports on the eastern seacoast of America. Travel time for mail from San Francisco to New York was shortened from several months to between 30 and 45 days; a vast improvement. Private companies, known as express companies, sprang up that provided much desired mail service to miners and others in remote locations within the interior of California. The Wells Fargo Express Company started an overland stagecoach service for freight and mail going east-west on a southern route from San Francisco and Los Angeles to El Paso, Fort Smith in Arkansas on to Memphis and Saint Louis; a trip of about 30 to 60 days. In April of 1860 the Central Overland California and Pikes Peak Express Company started a faster mail delivery service via a north-central route from St. Joseph, Missouri to Sacramento, California. This service, known as the Pony Express, provided a 10-day trip time in summer and a 12-16 day deliver time in winter using a horse relay system. A rider galloped his horse 10 miles between relay stations where he found a fresh mount and continued the relay night and day for a total of 60 to 100 miles. Subsequent riders would continue in similar fashion traversing the almost 2,000 mile route through the states of Missouri, Kansas, Nebraska, Colorado, Wyoming, Utah, Nevada and California. In fact, most riders were around 20 years old; the oldest being mid-40, the youngest 11. Not many were orphans, but all had to weigh less than 120 lbs because they carried approximately 40 lbs of mail in a special pouch called a mochilla (Spanish for saddlebags). They also carried a revolver, ammunition, water sack and a horn for alerting the next station of their arrival so a fresh mount would be ready and waiting for them. Riders received $25 per week compared to the $1 per week an average unskilled laborer received at the time. Among the 183 men known to have been Pony Express riders were Buffalo Bill and Wild Bill Hickok. 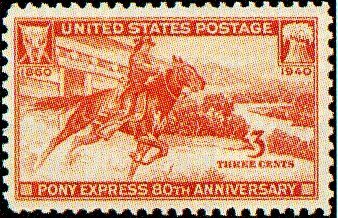 Two days after the connection of the transcontinental telegraph between Saint Louis and San Francisco, in October of 1862, the Pony express ceased operation. Only one rider, his horse and pouch were ever lost in the eighteen months the Pony Express operated. Although the $5 cost of a ½ ounce letter at the beginning of the service had dropped to $1 and its owners had spent $700,000 on the venture, it ended $200,000 in debt. Both paper and stone pay tribute to the Pony Express. 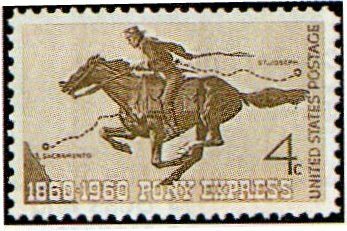 The USPS issued two postage stamps commemorating the Pony Express; one on April 3, 1940 and the other on July 19, 1960 (see below). Statues honoring the memory of the Pony Express reside in St. Joseph, Missouri and in Sacramento, California as well as in other places along its famous route. Eagle Mountain, Utah, located on its original trail, celebrates Pony Express Days annually during the first week of June. 2010 will mark the 150th anniversary of the Pony Express. A review of the current USPS stamp program for 2010 shows no plans for a commemorative issue. Perhaps in the minds of today’s USPS, cartoon characters take priority.